The Scuola Grande di San Rocco is a lay confraternity founded in 1478. The popularity of the cult of St. Roch, whose remains had been in the possession of the brotherhood since 1485, contributed to the latter’s rapid expansion to the extent of it becoming the richest Scuola of the city. At that point it was decided to build a new monumental headquarters and engage Tintoretto to decorate it with his most celebrated pictorial cycle, illustrating episodes from the New and Old Testaments. It is the only one of the historic Scuole Grandi to have survived the fall of the republic. It is a unique site, where over 60 paintings are preserved in their original setting in a building that has hardly undergone any alteration since its construction. The confraternity is still active today, carrying out its traditional charitable duties as well as looking after its extraordinary artistic patrimony. The Two Marys have crossed the Atlantic Sea and they are already on display at the National Gallery of Art in Washington, where they have been welcomed with great enthusiasm. The ticket office closes at 17.00. The Scuola Grande is open daily all the year round, including on national and religious holidays, except for Christmas Day and January 1st. The Church is open daily all the year round, including on national and religious holidays. On Christmas day, Easter Sunday and January 1st, limited opening: 9.30 – 12.30. Admission Entry fees qualify as contributions to the restoration and maintenance of the artistic patrimony incorporated in the Scuola and its Church, as well as to our various charitable activities. SKY ARTE HD, which in 2018 shot a film titled “Tintoretto – A rebel in Venice” (diffused in theaters on 25-26-27 February 2019 and then from the satellite network), sponsored also the restoration of two important paintings by Jacopo Tintoretto in the hall of the Scuola Grande di San Rocco: “The Reading Virgin” and “The Virgin in Meditation”. Recurring the 5th centenary of the artist’s birth, many great events have been planned to commemorate this important Venetian painter of the 16th century. After the two exhibitions of Tintoretto’s paintings that were held in Venice (at the Accademia Galleries and at the Palazzo Ducale), from March to June the National Gallery in Washington will host a major exhibition dedicated to this important Venetian artist. 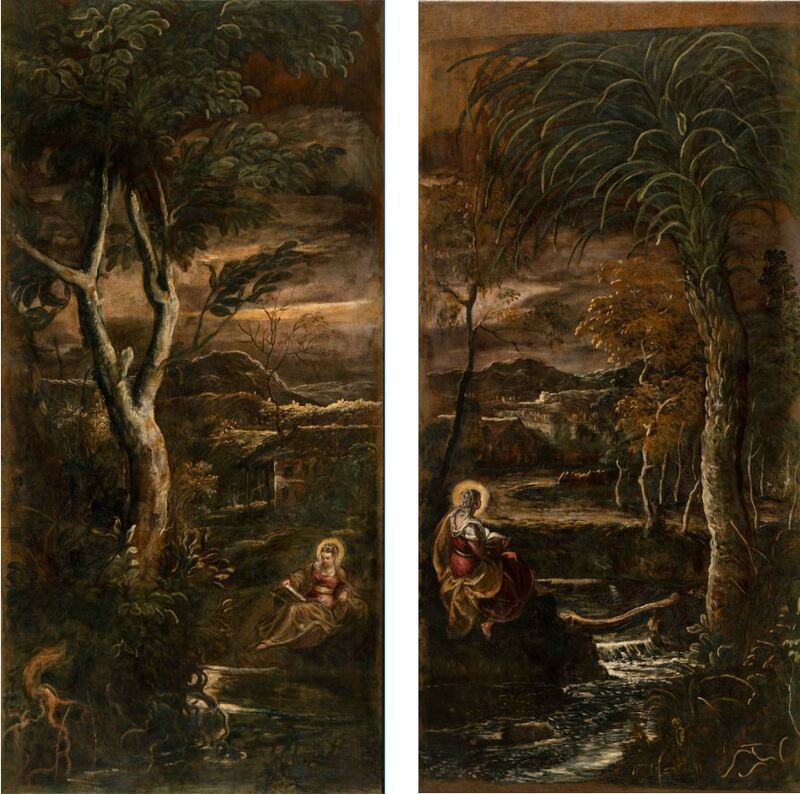 The Scuola Grande di San Rocco, which has more than 60 paintings by Tintoretto, will lend the two, recently restored, paintings for the great American exhibition. 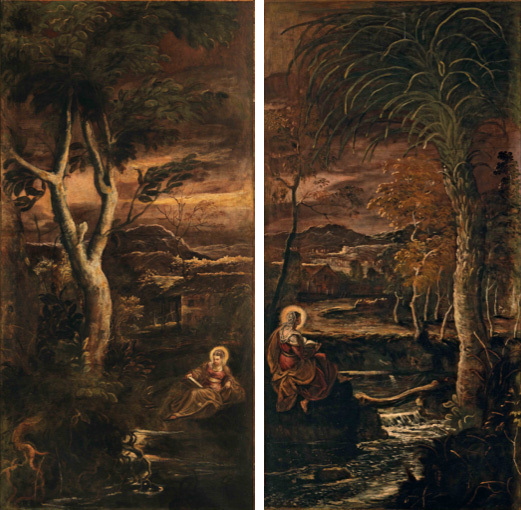 The two paintings (425×209 cm), often dubbed “The two Marys”, are late works of the great painter and are paintings of great modernity. In the two canvases the landscape has a preponderant part while the two figures are very small. The two images invite the visitor to reflection and meditation.